Do you like to create solutions to challenging problems? This fall, Zoohackathon will welcome technologists and coders at five locations around the world as they develop tech solutions to halt wildlife trafficking and the demand for illegally traded wildlife products. Wildlife trafficking decimates elephants, rhinos, tigers, and other iconic species. Come help us end these terrible crimes! 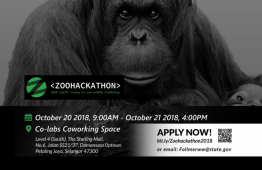 From October 20th – 21st the U.S. Embassy in Kuala Lumpur will be hosting the 2018 Zoohackthon, the first time the event has been held in Malaysia! The Zoohackathon is a computer-coding event that brings together developers, designers, project managers, and wildlife enthusiasts to create new applications and tools to help end wildlife trafficking. For an example of a past winning entry, "Safe Souvenirs" the 2016 Global winner, educates tourists about what they should/should not buy when they are on traveling. Along with Kuala Lumpur, Zoohackathon events will take place in New Delhi and Mumbai; Kampala, Uganda; Madrid, Spain; and San Diego, California. Winners from each event will compete for a grand prize, which will be announced on December 4. In addition to the entry into the global competition for the winner of the Kuala Lumpur Zoohackathon, the first, second, and third place winner will be awarded soon to be announced prizes as well. There is a limit of 75 individuals for the hackathon. Participants will compete in teams of 3-5 individuals for the event. Participants are encouraged to join as a pre organized team. When submitting RSVPs please place your group name in parenthesis next to your name and then have one team member follow up via the “contact the organizer button” with your team name and a list of the team members. Participants must bring their own laptops and are welcome to use their internet dongle for the event. Although there is no educational or work experience required to join, it is strongly recommended that at least some members have coding and website/app development experience. Breakfast and lunch will be provided. For more information on the Zoohackathon, please visit the global homepage for the event. 9:30: - 17:00: Venue open for development. 14:00 - 15:00: Announcement of winners, awarding of prizes, closing remarks.